In this article, I’ll be looking at the differences between ukuleles and guitars. This will be an in-depth look at ukuleles vs. guitars. If you just want to know if guitar or ukulele is easier, you can jump to the last section of this article or see my short guide, Ukulele or Guitar: Which is Easier to Learn? The most obvious difference between a guitar and ukulele is size. On average, ukuleles are around 35% to 50% smaller than most guitars. The size difference between a ukulele and guitar affects the volume, tone, and playability of each instrument. I talk about these areas in more detail below. The image below compares a soprano, concert, and tenor ukulele to a dreadnought guitar, which is the most common acoustic guitar size. I cover the baritone uke towards the end of the article. The exact size differences will vary depending on the manufacturer, but they’ll be pretty close to what you see here. You can learn more about the different uke sizes in my guide to ukulele sizes. The number of strings is another obvious difference between guitars and ukuleles, but it’s also one of the most important. Since a ukulele has two fewer strings than a guitar, many people consider it a less difficult instrument to learn. Fewer strings also mean there are plenty of simple one- and two-finger chords. These easy chords give new players a nice “onramp” into the world of stringed instruments and allow them to start making music quickly. Both guitars and ukuleles come in alternate string configurations such as 12-string guitars and 8-string ukuleles. However, the majority of guitars and ukes will have the standard 6-string and 4-string styles mentioned above. For the most part, uke strings are softer, stretchier, and less “tight” feeling than guitar strings. This is one of the reasons that the uke is often viewed as a more comfortable instrument to play than guitar. It’s also part of the reason ukuleles tend to have a more warm, delicate tone. Ukuleles tuned low-G will usually have a single metal string. This string is made of a thin core of synthetic threads with a metal winding, much like a guitar string. 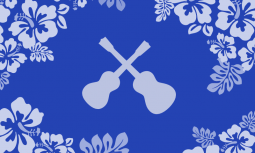 The ukulele and guitar are tuned differently, but they are related. If you put your finger (or a capo) across the four highest-pitched strings on a guitar at the fifth fret, you’ll get the notes of a ukulele. In other words, a ukulele is like the top four strings of a guitar, but tuned up a fourth. The image below shows the relationship between a guitar and ukulele fretboard. The green section shows where the notes of a guitar and ukulele overlap. If you’re using standard ukulele tuning, the ukulele’s G string is tuned up an octave. If you’re using low-G tuning, the notes are exactly the same as the top four guitar strings at the fifth fret. These tuning similarities mean that many chord shapes are the same on both instruments. Some guitar chords work fine on a ukulele, like a D guitar chord. Playing this shape on a ukulele results in a G chord, which is a fourth higher. For guitar chords that include the low E or A, you can often just use the same shape but remove the bottom two guitar strings. Sometimes, taking out the bottom two strings of a guitar chord removes important notes in the chord. Transferring a guitar shape directly to the ukulele can result in a chord that isn’t as well defined and may not sound the way you expect. String tension is a measure of “tightness” or “looseness” of the strings on an acoustic instrument. As you can see, the string tension of a guitar is roughly three times that of a ukulele. Instruments with high string tension are usually louder and brighter sounding, but the tightness of the strings makes them harder to play. On the other hand, low-tension instruments are easier to play but aren’t capable of producing as much volume. String tension can vary a lot depending on factors like string material, thickness, and scale length. A big difference between ukulele and guitar is tone. However, there are so many variables in an instrument’s construction that it’s impossible to offer a one-size-fits-all explanation. Factors like tonewoods, body size, and manufacturer all affect tone in ways that can be hard to quantify and describe. With that in mind, these brief descriptions should give you a basic idea of what to expect. Don’t forget that play style has a huge effect on tone. For example, aggressive strumming will accentuate completely different traits of an instrument compared to delicate fingerstyle playing. In general, guitars are louder, brighter, and have more bass than ukuleles. This is mostly due to the guitar’s bigger body, larger pitch range, and high-tension steel strings. Guitars are often played with a pick, which results in even more volume and brightness. Compared to the guitar, ukuleles have a quieter, mellower, tone that’s more treble-focused. I’ve seen people describe a ukulele’s tone as gentle, sweet, or harp-like. These characteristics are mostly due to their smaller bodies, soft strings, and low string tension. Classical (nylon string) guitars have a tone that is similar to a ukulele, but with the added volume and bass of a guitar. On a stringed instrument, the scale length is the distance between the nut and the saddle. It’s the section of the strings that vibrates when you play. A ukulele’s scale is 25% to 50% shorter than a guitar, which means that the frets are closer together on a ukulele. Closer frets mean that players don’t have to stretch as far to form chords. This is ideal for children, folks with smaller hands, or anybody who wants an instrument that’s comfortable and easy to play. Scale length also relates to string tension. Shorter scales typically have lower string tension than longer scales. Price doesn’t come up often when discussing the differences between ukulele and guitar, but it’s worth mentioning. You can buy a very good beginner ukulele for $50 to $100. This might seem like a lot, but in the realm of acoustic instruments it’s actually pretty cheap. A decent beginner guitar (by my standards) is going to cost a bare minimum of $150, and guitars in this price range often need adjustments and setup work before they’ll play comfortably. If you’re on a budget or looking for an instrument for a child, I think it makes more sense to buy a good uke for under $100 instead of a so-so guitar for over $150. Want to learn more about finding a good ukulele on a budget? Check out my articles on the best beginner ukulele, ukuleles prices, and cheap ukuleles. Baritone ukuleles are the largest of the four primary ukulele sizes, with a total length of around 26″. Unlike the other three sizes (soprano, concert, tenor) a baritone ukulele is tuned exactly like the top four strings of a guitar: D-G-B-E. In other words, a baritone ukulele is like a guitar without the two lowest strings (E and A). This means many guitar chords translate directly to a bari uke, but as I warned earlier, some guitar chords won’t sound right without those bottom two strings. The baritone uke’s similarities to the guitar make it a natural second instrument for many guitar players. You can learn more about baritone ukes in my article on ukulele sizes. Ukulele Vs. Guitar: Which is Easier to Learn? I think the uke is easier than the guitar to learn and more accessible to new players. While there’s no substitute for practice and dedication, the uke has fewer potential learning roadblocks. In my experience, players with no previous experience progress more quickly on a uke, which leads to more enjoyment and more time spent playing. Of course, if you want to learn the guitar, go for it! There’s nothing wrong with starting on a guitar if that’s what you really want to play. Just keep in mind that the learning curve is a little steeper on guitar.